We had a very eventful day full of remembering and giving thanks for the Providential hand of God in our lives. Daddy read the historical account of how the Gospel was spread westward and laid out God’s Providential guiding hand in the lives of the Separatists who fled their homeland for Holland and then 12 years later fled Holland for America. It is a mighty story of God’s faithfulness even amidst trials and tribulations. It is a story that we tell our children so that they will remember where they came from and hopefully to instill in them the commitment and courage to take similar stands our forefathers took for the sake of the Gospel. In the middle of our history lesson, we were interrupted by a herd of deer grazing in our yard. One of the children saw the deer out of the living room window and we all jumped up and enjoyed watching them. We, of course, feasted on the bounty that the Lord has provided and gave many thanks in speech, action and by index card. Index Card? We started a tradition several years ago where we leave a container on the table where we can put handwritten “I am thankful for….” index cards in the jar to be read Thanksgiving night as we gather around the table again for supper. Daddy reads the cards and we all enjoy hearing what everyone has written down. The younger children who are unable to write yet, draw pictures of things they are thankful for or they can enlist an older buddy helper to write what they say. It is a wonderful time of reflection, remembrance and thanks! One thanks we all gave was for the beautiful turkey our family was blessed to raise here on the farm this year. The turkey meant all the more to us knowing that the work and care paid off in, not only a wonderful learning experience for us, especially the boys, but also the provision of meat for our family. We had one small problem at about midnight last night. 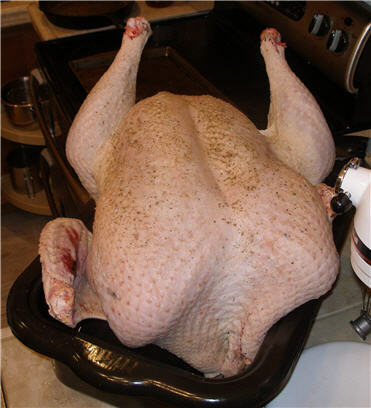 That 40 lb turkey doesn’t fit in a 22 quart roasting pan. 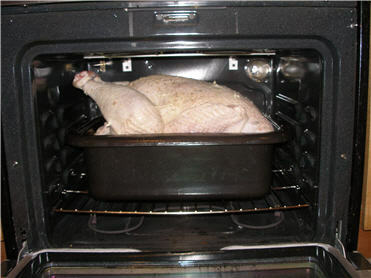 However, that was the only pan we had that came even close to housing that massive turkey. After a little bit of prodding and shoving….We fit the turkey in the pan. It was a snug fit, but it would have to do. Thankfully, it did fit in the oven and about 8 hours later it was ready. We overestimated the cooking time and even though it was a little more done than ideal, the meat was absolutely wonderful! We will be definitely raising our Thanksgiving turkey in the years to come (and hopefully additional turkey to sell)! We also took a “Turkey Trivia” quiz during the day that my husband found online and set up for us all to take. The winner of the trivia quiz was our 10 year old… He beat out mom and dad even! The winner of the quiz was privileged with being able to pull the turkey wishbone with the one who raised the turkey. 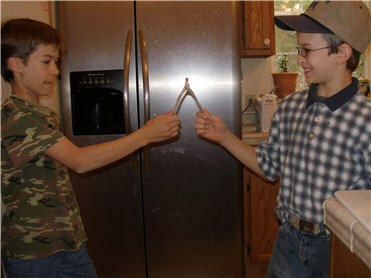 Here, the boys pose for a picture with the massive wishbone. Wow! Talk about stuffing for Thanksgiving! That turkey is huge! We might do this in the future. I am still so squeamish about blood and stuff. Maybe you or others could share how you get past that! Or do you just sit back out of the way and let hubby and children do it all? That is a HUGE turkey. One year we got turkeys from a local place. They were only $2 and you could go and pick them up. The only catch was that they were all toms. We had figured out already that 17 weeks is the average time to raise a broad breasted white from poult to table size. Our largest that year was 27 pounds. The average weight was 22.5 pounds. Our customers were not thrilled, although they all took their birds. Now, we get straight run through the mail and we raise them 16 weeks. We get a good range. This year we ended up with 22 live ones out of 25. They went from 15.5 to 22.5 pounds. What a lovely post! What a turkey! Dear Vaughn Family, we just loved seeing this! We fondly remember meeting ole Tom when we first visited your farm! It’s hard to believe that turkey weighed more than my 5 year old! Beth, did I see a slight sag in the oven rack under the weight of it?? Thank you for sharing!